Refined and powerful, our 2014 Jeep Wrangler Unlimited Sahara 4x4 in Billet Silver Metallic Clear Coat is ready to get dirty! Powered by a 3.6 Litre V6 that produces 285hp and almost as much torque while combined with a durable 5 Speed Automatic transmission. With our Four Wheel Drive, you can maintain civility or carve your own path where ever you see fit while enjoying near 11.2 L/100km on the highway. The Sahara goes beyond basic by offering bold wheels, body colored fender flares, and side steps for easier access. The interior of this Sahara was made with you in mind. Creature comforts such as a color touchscreen display, power accessories, and heated front seats to wrap you in comfort while you seek out your next adventure. If you get the urge to take an open-air cruise, just remove the top, put on some shades, crank up the Uconnect sound system with an audio input jack and available satellite radio, and hit the road! A strong safety cage surrounds you in this Jeep, multistage airbags protect you, and Hill Start and stability control help you along the way. 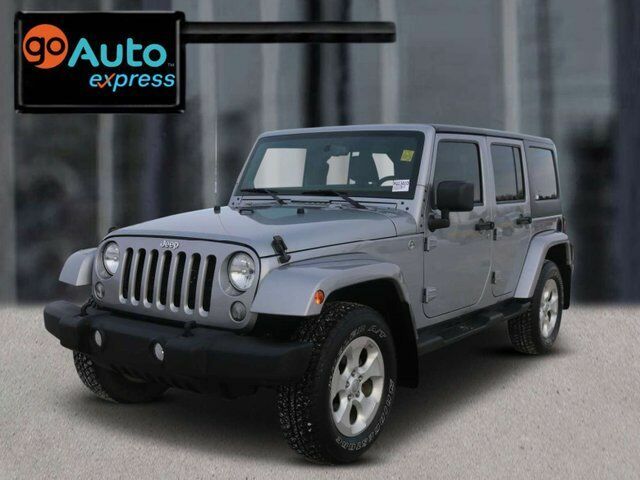 Our Wrangler Unlimited Sahara offers all of the legendary rock-climbing ability of America's favorite off-roader, with a dose of comfort to go along for the ride! Print this page and call us Now...We Know You Will Enjoy Your Test Drive Towards Ownership! AMVIC Licensed Dealer.